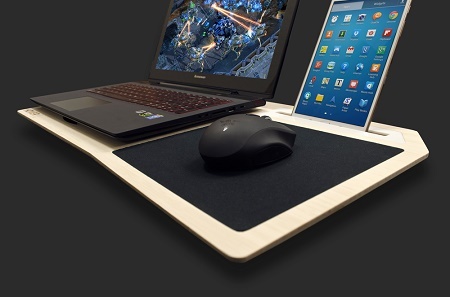 The Hover X LapDesk – why leave the couch if you don’t have to? We love gaming on a PC, but it requires that we be glued to our computer chair for several hours at a time. Sometimes you just need a change of scenery, and that means playing on the couch with your laptop like a barbarian. The only problem with playing on your leptop without a proper desk is that you have no stability, no place for your mouse, and your phone will undoubtedly get knocked under a cushion. Whether it be circumstance or choice that you veer to the couch to game, you probably want a better way to play so your stuff doesn’t end up all over the place with you stuck in a tangle of cords. The Hover X is a lapdesk made of bamboo with a mousepad, heat vents, and mobile device dock built in so everything you need will be right in front of you. The dock is padded with acrylic and felt to make sure your glass-faced devices will be safe, and the mouse pad is 1/4” thick. The vents will let some of the heat escape, but the bamboo will also absorb some of it. The only issue with this setup is that you will need some manner of cable management lest you want to accidentally pull everything off when you’re getting up. This is going to cost you anywhere from $98-109 depending on whether you want this to fit your 13-15” or 17” laptop. Having a few of these handy could allow you and your friends to play some WoW without having to set up multiple stations, as these are like the TV trays of desks.